Water Slide Combo - "Rocket dual lane 6 in 1"
Here it is! This 6 in 1 bounce house combo has everything! This inflatable combo has it all. Including a bouncing area, basketball hoop inside, two pop ups and a mini climbing wall that leads into an awesome water slide! The Rocket 6 in 1 inflatable combo bounce house offers bright, vibrant colors to match any party theme. 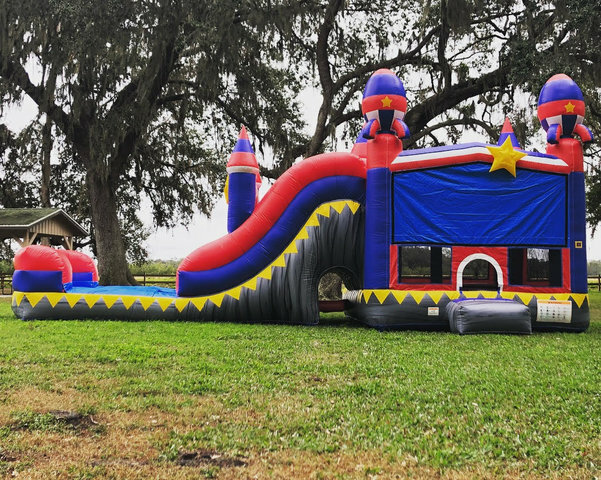 Perfect for backyard birthday parties, Fall Festivals, Spring Flings and any other event that requires children entertainment in the Davenport, Clermont, Winter Garden, Kissimmee and surround areas! This unit can also be used as a Dry Slide <<<< Click there for more information!